I’ve Got a Starter Kit – what next? 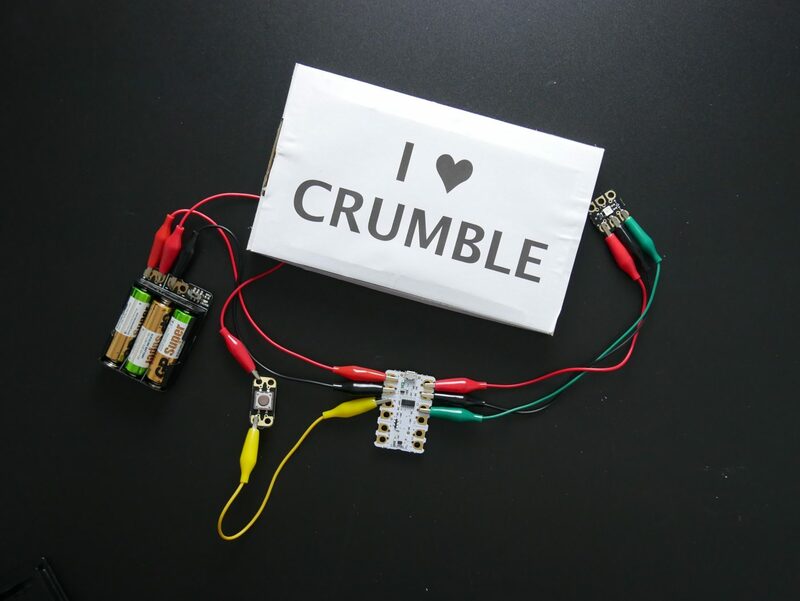 You’ve been lucky enough to get your hands on a Crumble starter kit, you’ve connected bits together and managed to get a Sparkle shining red, but now what? What else can you do with it apart from make a red light? We’ve decided to collate a list of inspiration and ideas for projects that you can make using only the contents – and container – of the starter kit. We’ll start with the simpler projects, before looking at a couple of more advanced ones. First up we have a simple timer. 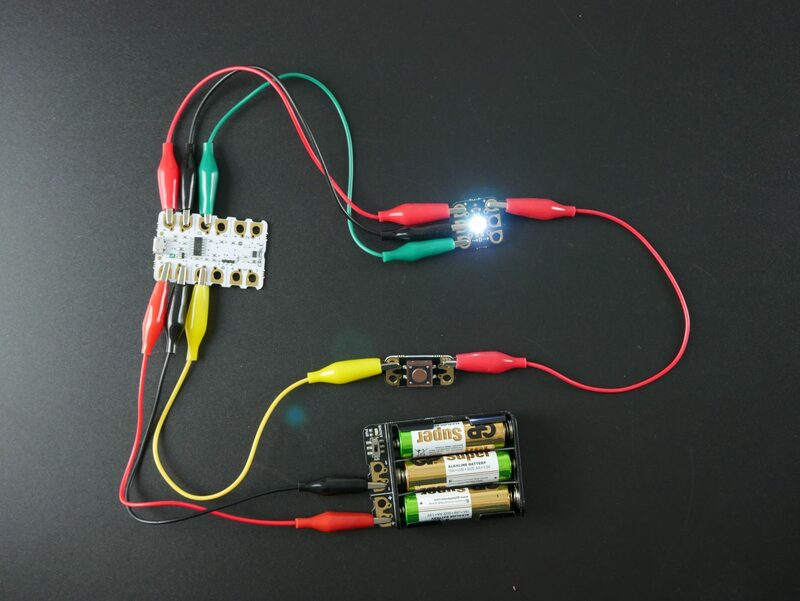 This can be made as simple or advanced as you like, but the main premise behind it is that a timer for 30 seconds will start when you press the button. The program is simple. Wait until the button is pressed, turn on the Sparkle white, then after 30 seconds, turn it off. The program then repeats, waiting for the user to press the button to start the timer again. This could easily be extended by adding in a nice pulsing effect every second, getting faster near the end of the time limit. Next up we have the classic ‘police lights’ project. You can start off by making only the lights, which you can then ’embed’ into a model police car. If you are feeling particularly creative, you could use the starter kit box to make a chassis, which you can then turn into your own ‘moving’ vehicle! As a starting point, we want to make the two sparkles alternate between red and blue. This could then be elaborated on, to create extravagant flashing patterns, or even use the switch to cycle between various styles! This is one of the simplest, yet most satisfying programs! To represent police lights, we turn the Sparkles on red and blue, then after a short time, we switch their colour. Now we have an example of a simple project, with a bit more ‘making’ involved. The lightbox is made using either the starter kit box, or another box, and a piece of paper. We then can light up the message using the supplied sparkles. To make the programming more difficult, we can control the lights via the switch, make them change colour or even fade through the RGB values. The programming for this project is surprisingly simple, once you know how. We are going to wait for the button to be pressed, and A to become HI. Then we’ll turn on the Sparkle(s) white (you can use as many as you like with this code!). Then, each time the button is pressed, the Sparkle(s) changes to another colour, or off. The wait statement allows us time to remove our finger from the button, setting A LO. If we didn’t have it, the program would skip through repeatedly, as it runs faster than we can move! 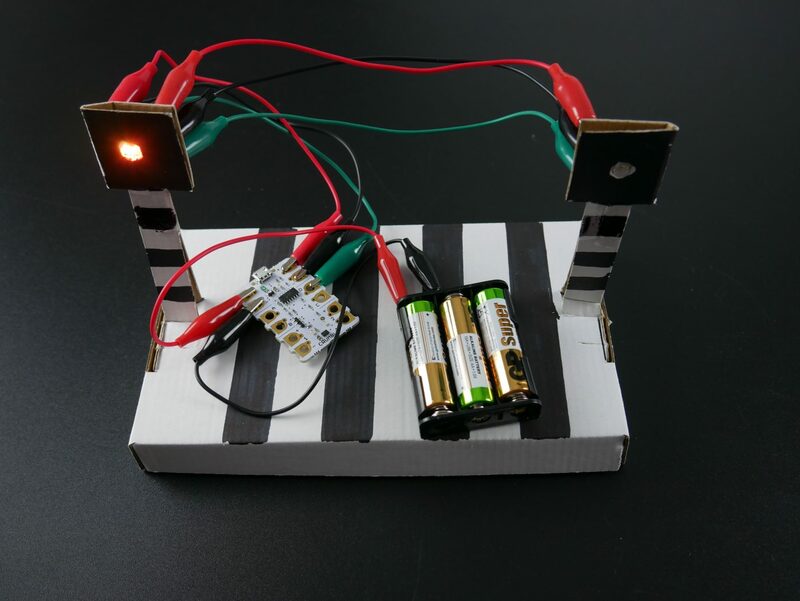 For our final basic project, we have our very own model Zebra crossing, complete with flashing Belisha beacons! Using most of the starter kit box as the ‘crossing’, we’ve made two beacons out of some of the lid from the box. Programmatically, this isn’t too taxing – its an infinite loop, alternating each light. 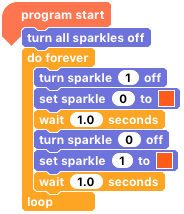 This code is nice and simple – set one Sparkle to Orange, and the other one off. After one second, switch them around so that the orange one turns off, and the one that’s off turns on orange. Wait another second before repeating. This will then give us the effect of them flashing alternately. Now we move onto some projects for those of you who are more experienced. First up, we are going to look at a simple reaction time gamer. One Sparkle will light up after x milliseconds, then you have to press the button as quickly as you can. Within a set amount of time, and you get a green on the other Sparkle, but too slow and you’ll get red. Now that we have moved onto something more complicated, the code has gotten longer, however, it is just as easy to understand! 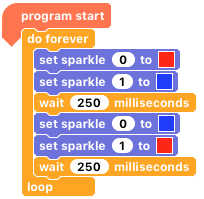 This program waits a random amount of time (0.5 – 3.5 seconds) before turning on the Sparkle white. 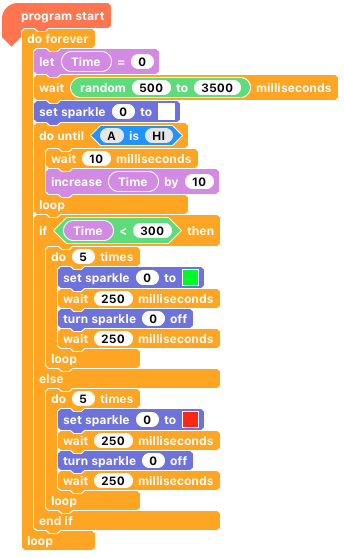 It then ‘times’ us by adding 10 to our ‘Time’ variable, every 10ms, until the switch is pressed. If we took less than 350ms, we get a green flashing Sparkle, but if we took longer, it goes red! If you have a Sparkle Baton, check out this project. 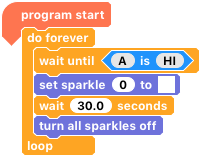 On the theme of reaction-based games, we have our ‘Sparkle Snap’ game – The two Sparkles light up a random colour (from a predefined list), if they match you must press the button as quickly as you can. Succeed, and you’ll be rewarded with flashing green Sparkles. Get it wrong, and you’ll get red. We’re starting off by lighting each Sparkle one of three colours. 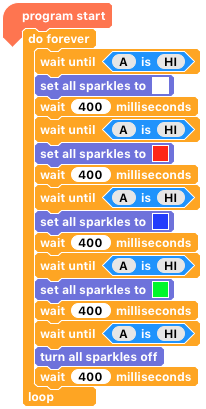 We’ve assigned ‘ColourOne’ and ‘ColourTwo’ a random number between 0 and 2, and then using selection (if statements), we’ve lit the Sparkles depending on the variable values. It’s worth noting that this section could be far longer, if you want a wider range of colours. The Sparkles are then on for either 500ms or until the button is pressed. If the time elapses, the game just continues, whereas if the button was pressed, we check to see whether the two colours (variables) are the same. If they are, then we flash green for 2.5s, if they weren’t, then we flash red for 2.5s. This game could be taken a lot further if you wanted too – making it get faster after each correct guess, adding in a penalty if you miss a pair etc. 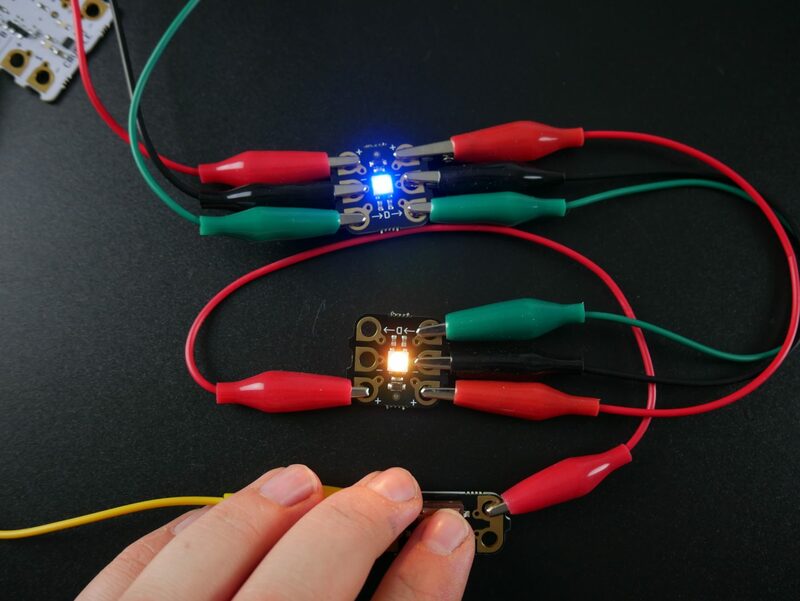 Next up we have a slightly simpler project to the previous two – morse code. 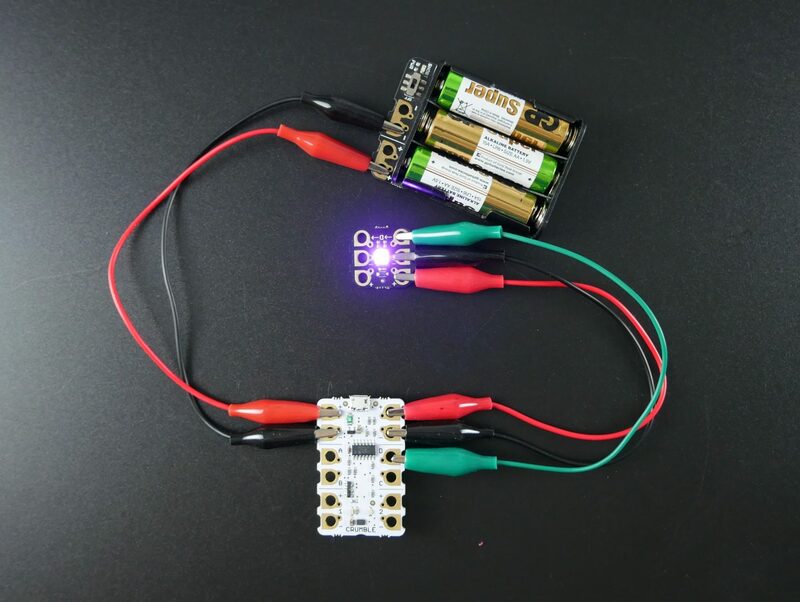 Using a Sparkle, it is possible to flash an array of messages, using morse code. This one is fairly self-explanatory, and using a variety of wait statements and repeat loops, it is easily achieved. This is the less efficient way of making this program, but it works nonetheless! Put simply, we have flashed our Sparkle based on something in Morse Code. This is achieved by using the wait statements, to correctly display a dot, dash, the gap between letters and the gap between words. 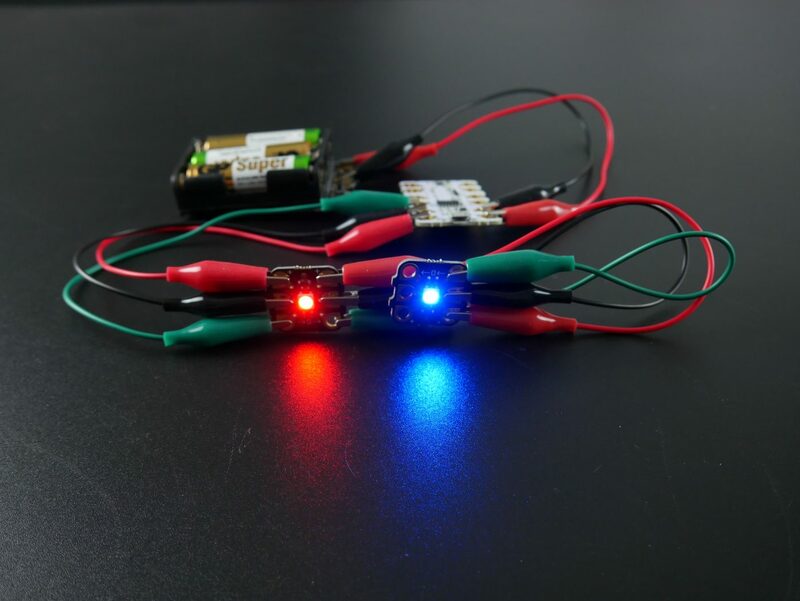 If you want another starter kit, ‘code’ based Sparkle project, check out our Lighthouse. 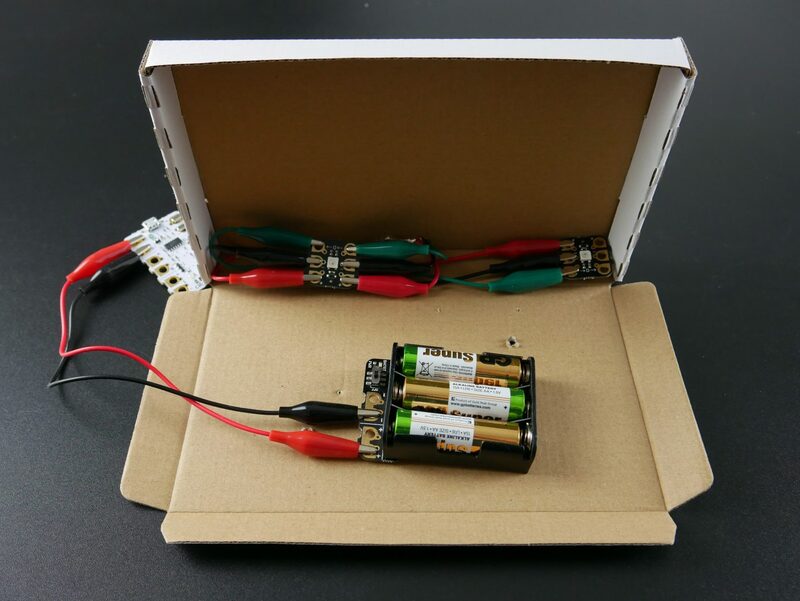 Finally, we have another ‘maker’ based project, using the starter kit box (or other). By colouring the box in black, and poking some carefully placed holes, we can easily make a ‘constellation’. We can then add some realistic twinkling, by randomly choosing shades of bluey-yellowy-white. Although simple to make, it is a nice programming exercise using repeat loops and variables. Our last code segment is actually quite simple. By defining the range of various random number blocks, and placing them in the RGB sections of the Sparkle variables, we can define a random set of colours. Then, by waiting a random amount of time for changing them, we can get a realistic twinkling effect! There are numerous possibilities when it comes to deciding ‘what to make’ using the starter kit – many more than we’ve listed here. Hopefully you’re now feeling more inspired, and have some fantastic ideas of what to make at home, or with your class. 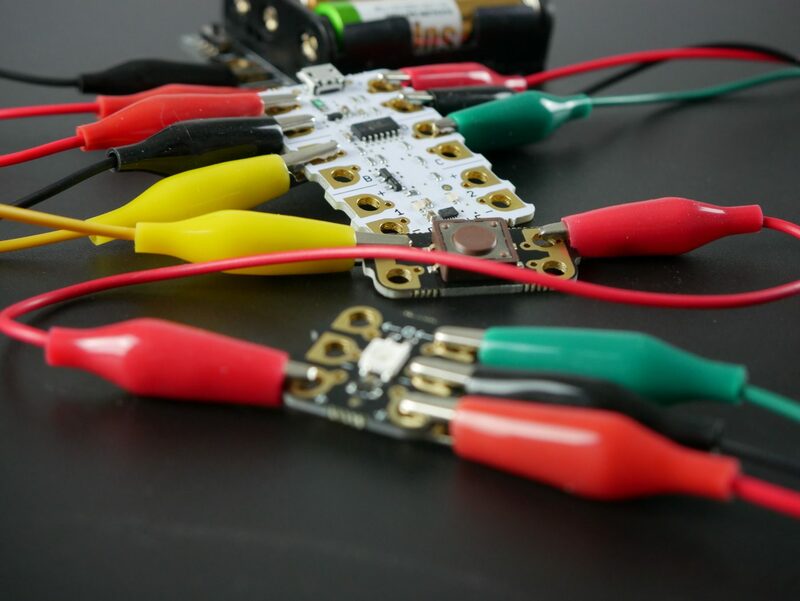 If you have other Crumbs and components laying around, don’t forget to head over to our Projects to see what else you can make. Have a cool idea that we’ve not listed here? Please don’t hesitate to drop us a message on our contact us page, or Twitter!